We have a new twist on this week's challenge. We hope you enjoy it. 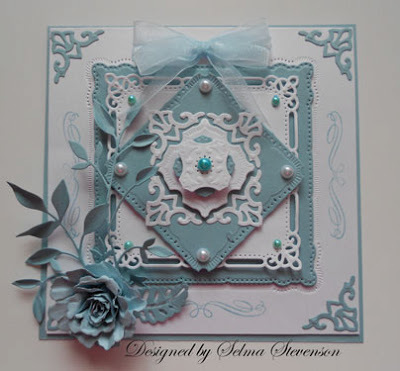 Selma created these two beautiful cards. Which one do you like the best? It is amazing how you can change the final look of a card by adding a few more details to it. You can read what Selma did by clicking here! Post a picture of both cards on your blog or Splitcoast gallery. You will have until next Thursday (May 30) morning 6:00 AM EST to link your project. A winner will be chosen from a random drawing for week #20 The winner of the challenge will be announced Friday, May 31. This week's winner will receive a LaBlanch Stamp. The winner will also be entered in the 2013 end of the year $100 gift certificate drawing. 3. Or if you are posting to the SCS gallery, you will need to use a special code to tag your card to the challenge. This week's code is joansgardens, JG0523 and needs to be posted with the challenge. Please enter both on the same line with a comma between as I have shown. What a fun challenge! Thanks, Selma, for your usual great inspiration. 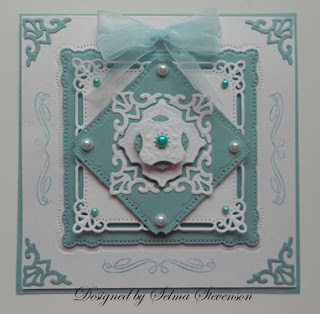 My embellished card is the first one! There still seems to be a change from the gallery to the blog - some of the card has been cropped. Sorry about that! This was a interesting challenge. I made the card in two versions and they're posted on my blog, but the link button wouldn't let me back in to post the second card. Another learning curve!